But this blog is about THINK WEDDING! Next weekend, February 21- 22, we invite you to shop Story City for everything you need to make your day special! It seems like every Jan/Feb you can go to large auditorium-like wedding shows that sell you stuff. I’m not crazy about that. It’s fun to go see but I like to create…inexpensively. How about you? I can spend hours looking at Pinterest & Face book; there are just too many great ideas. You can get lost in all the ideas. 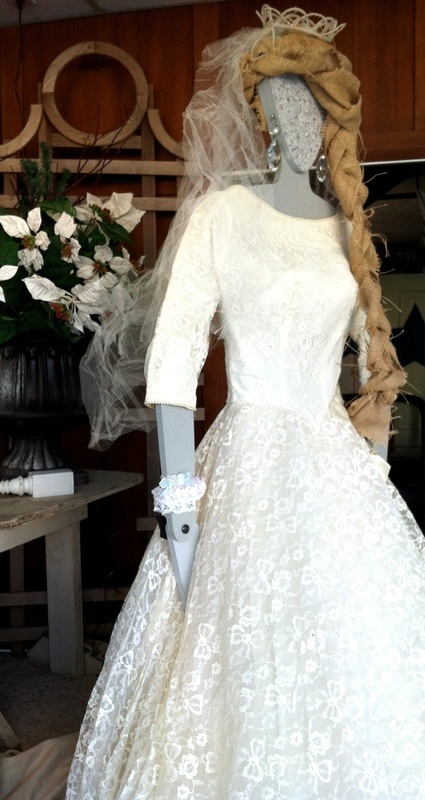 There is even a magazine with flea market wedding ideas! 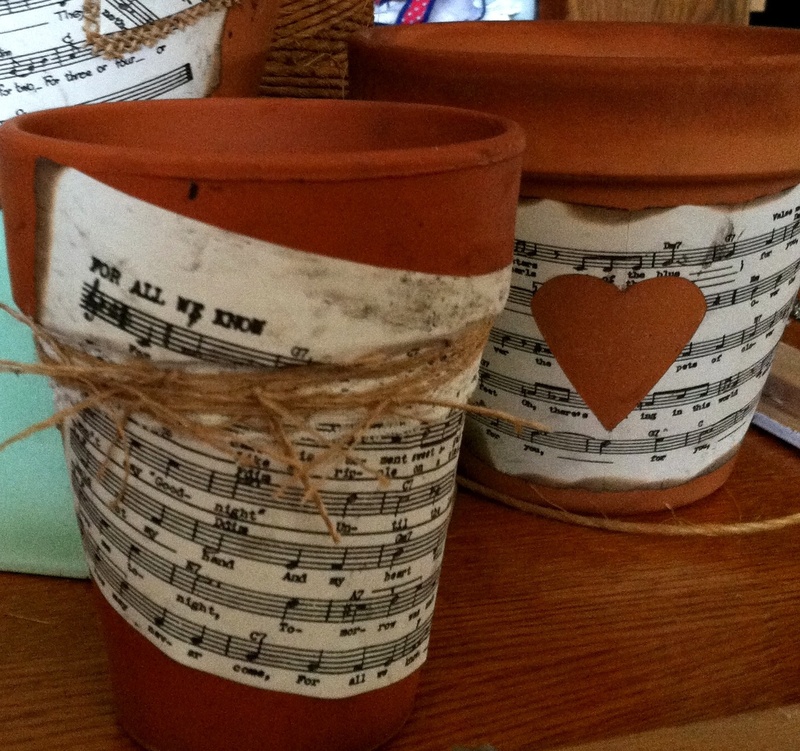 Anything & everything can be revived, revised, repurposed into a wedding tablescape or a wedding favor. 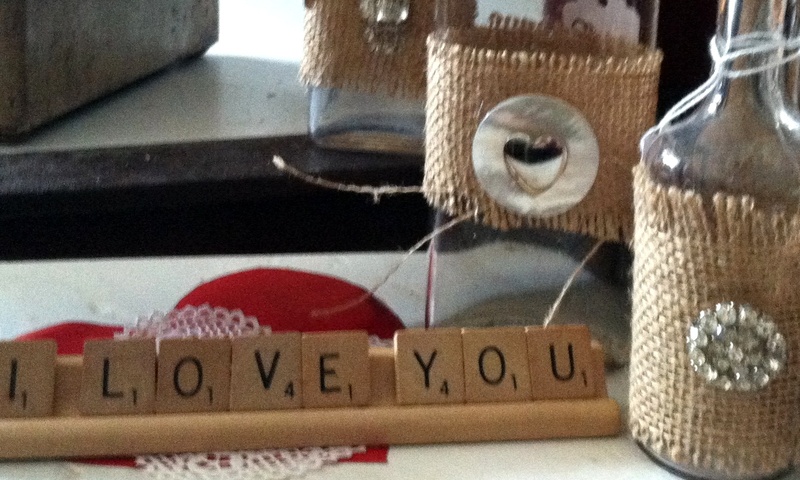 Do you LOVE to go junkin’ for bits, pieces & parts? 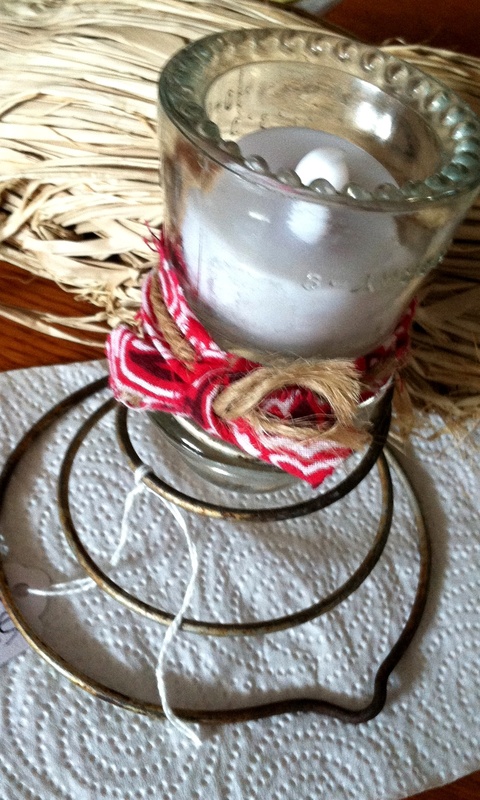 It is great to save some money, be crafty-artsy-creative & save the environment too. 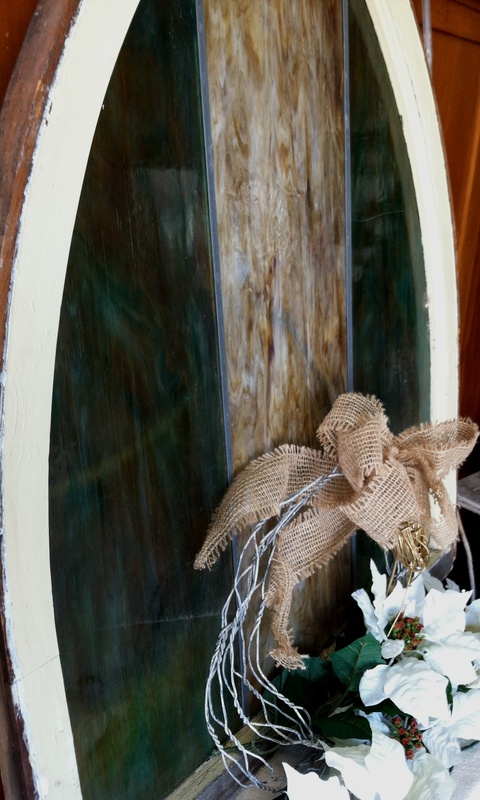 And using vintage JUNK for your shower or wedding is just plain FUN. 1. Canning jars…EVERYONE uses them & at every wedding but they look different with each application. Ball jars are beautiful filled with ditch flowers (free weeds & grasses). They are great in clear or in aqua blue! Ball jars are great painted…a single color or dipped in the colors of the shower/wedding. 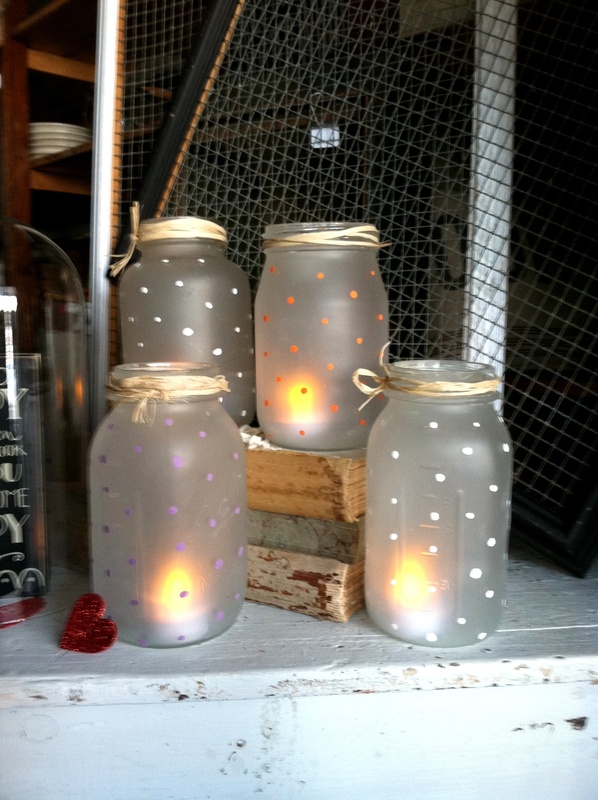 Ball jars are pretty frosted & polka dotted & with a candle they are so soft! 2. What’s another cheap vessel: clay flower pots or old clay drainage tile. Casual & natural with earthy color schemes, I can see them filled with curly twigs. Decoupage your wedding announcement on them or a favorite picture of you & your honey…or a different picture for each table. Cut hearts or stars or your initials out of the paper or layer the paper with wedding colors…whatever you want! 3. If you are really on a budget, think about what do you have lots of …milk glass florist vases? Old maps? Old books (that you can cut up)? At every auction in the last year, old pressed pattern glass sold CHEAP as in $2.00 to $5.00 per box! Pressed glass vessels create a pretty wedding. Stemware, plain or etched, also sells for a song & it so unusual used as candle holders. Little battery-operated tea lights make will make the crystal shimmer & set one at each place setting with a little note as a favor for each of your guests. These are also fun filled with candies (in wedding colors of course) or with cupcakes in them. Think outside the box…it doesn’t have to be wine. 4. 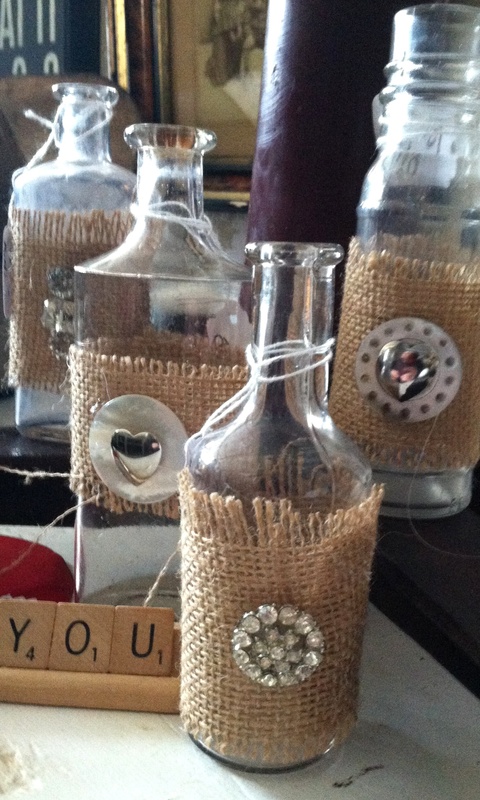 Burlap…it is still a surprise to me that for the last two years burlap is POPULAR with wedding decor. Plain or stenciled…it can be used with either ball jars or elegant glassware! And, it doesn’t have to be hemmed…it looks good fraying too. Have I given you enough ideas for one blog? 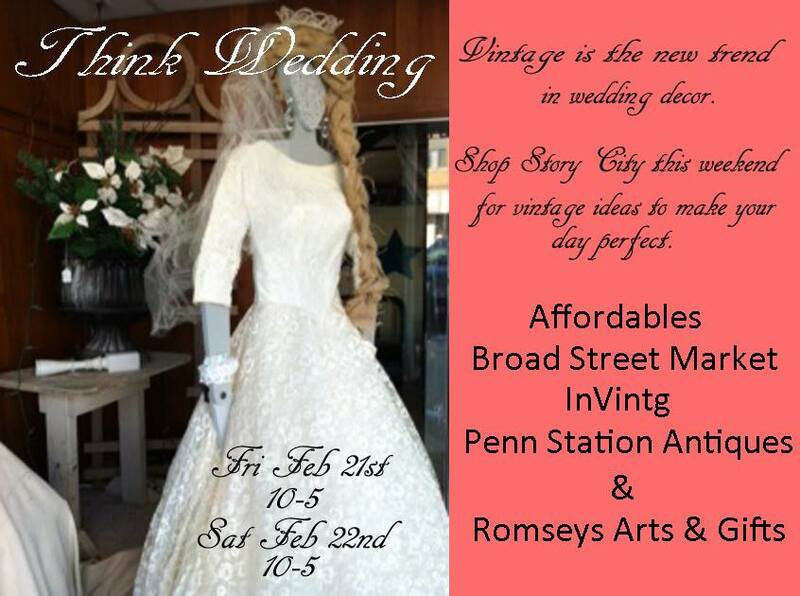 Come visit us at Antiques Iowa on I-35 or at InVintg (inviting vintage) just downtown Story City & explore for stuff for your next wedding or wedding shower. « Give light and people will find the way.